I spent a lot of last summer’s break reading non-fiction young adult novels because my students need to read more non-fiction which means I have to read more non-fiction to introduce them to great books. With the rise of the common core and college-readiness curriculum, it’s what the language arts classroom looks like right now. 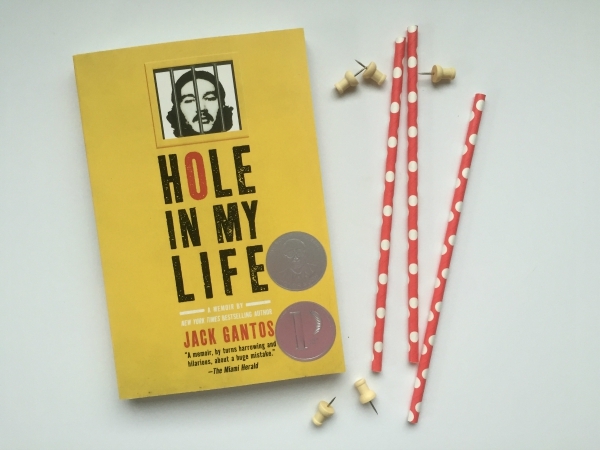 And so: Hole in My Life by Jack Gantos. Gantos is famous for the Joey Pigza series which a lot of my students love and also the book Dead End in Norvelt which I added to my classroom library last year but haven’t read yet. Hole in My Life tells the story of Gantos in high school, his unconventional life, his lack of parental supervision (and by “lack” I mean they lived in another state), and the choices that led him to agree to help smuggle over a ton of hash from Morocco to New York City. Inevitably, he gets caught and ends up in federal prison. Watching Gantos, who is obviously smart and talented and dreams of going to college to become a writer, make such horrible choices is a powerful lesson in what happens when we make rash, bad decisions. Hole in My Life is a engaging story about how small choices shape our lives and what power we have to change ourselves in spite of a bad start. « what in the world are you doing?